Notre Dame-Fairfield's CJ Davidson flips a crosscourt pass on Saturday, Dec.28 in the championship game of the Fairfield Prep Holiday Classic boys basketball tournament at Fairfield University's Alumni Hall. Prep beat Notre Dame 83-52. Davidson was named to the all-tournament team. Notre Dame-Fairfield's CJ Davidson flips a crosscourt pass on Saturday, Dec.28 in the championship game of the Fairfield Prep Holiday Classic boys basketball tournament at Fairfield University's Alumni Hall. The two most athletic plays belonged to Notre Dame-Fairfield -- Joe Cantey's layup over Fairfield Prep's 7-foot-2 all-stater Paschal Chukwu and Clinton Davidson's balancing act to keep the ball inbounds -- but most of the other fancy plays, as well as the bulk of the soundly-executed basics of dribbling, passing, shooting, rebounding and defending, belonged to the Jesuits Saturday night at Fairfield University's Alumni Hall. Prep built a double-digit lead in the first half of the first quarter in the finals of the annual Fairfield Prep Holiday Classic, and the Jesuits beat Notre Dame 83-52. Prep, employing a nasty pressure defense, improved to 4-0 overall and the Lancers fell to 1-3. Fairfield Warde's 60-50 victory over Fairfield Ludlowe in the consolation game earlier in the evening left the Mustangs and Falcons each with 1-3 records. "We had way too many unforced turnovers," Notre Dame coach Vinny Laczkoski said. "You have to give them credit. They took away a lot of our passing lanes. They just have a lot of answers as a team." Prep senior co-captain Dave Zielinski was named the tournament's MVP. He was joined on the all-tournament team by teammate Tommy Nolan, another Jesuits' captain, as well as by Notre Dame's Davidson and Jaylen Jennings, Warde's Nick Cotto and Ludlowe's Mark Malone. Zielinski scored a team-high 18 points, one of six Jesuits to reach double-figures. Ryan Murphy, Ray Featherston and Chukwu, recovering from a back injury, each scored 11 points and Keith Pettway and Tommy Nolan both added 10 points. In the first game, Cotto scored 20 points, 11 in the second half, and sophomore Giacomo Brancato scored 16 points. Warde's Brandon Bisack scored all 11 of his points in the second quarter when the Mustangs erased a 13-9 deficit entering the period and took a 30-23 lead into the half. Malone scored 12 for Ludlowe, which was second highest to teammate Darren Lee's 15. The Lancers could not handle Prep's pressure in the championship game. "I thought we played better defense tonight than we did in the first game (Thursday)," Prep coach Leo Redgate said. "I was proud of our full-court and half-court defenses. We thought CJ (Davidson) would be a game-changer potentially for Notre Dame. We did a good job with the players we had on him. Jaylen Jennings had a great game." It was the work of Prep's deep rotation of guards --in setting the tone for its presses and in moving the ball upcourt in the Jesuits' quick-paced offense -- that took control of the game. The four primary guards were Zielinski, Nolan, Keith Pettway and Murphy. "All four of our guards have improved dramatically since last year," Redgate said. "I was proud of Dave (Zielinski). I thought he brought it consistently in both games. The year of maturity of Keith has been huge." Prep held a 25-8 lead after the first quarter and was up by 53-20 after the first half. Notre Dame faced a 72-35 deficit entering the fourth quarter. The Lancers outscored Prep by 17-11 in the final period that was dominated by each team's reserves. "We tried to double-team Chukwu down low," Laczkoski said. "I'd rather be beat from 20 feet than from two feet, particularly when he dunks from on top of your head. When you add him to the mix, they're a pretty good team. He just kicked it out to their guards and they made most of their shots. And their guards were able to penetrate and they threw him (Chukwu) alley-oops." Warde's strong defense limited Ludlowe to 10 field goals -- and no 3-pointers -- in the Mustangs' first win of the season. The Falcons were ahead by 9-4 after 5 minutes and 9 seconds of the first quarter. The Mustangs got hot and outscored Ludlowe by 16-4 to end the first half for a 30-23 lead. Before Warde's run, the Falcons held Warde scoreless for a span of 4:20 that began in the first period and continued into the second quarter. Ludlowe outplayed Warde in the third quarter, cutting the deficit to 42-38 at the start of the fourth quarter. A basket by Lee got the Falcons even at 42-42 in the second minute of the fourth quarter and a steal by Matt Doyle leading to a Chad Peterson layup forged a tie at 46-46 midway through the fourth quarter. The Mustangs responded with composed and aggressive play. Cotto's drive for a bucket gave them a 50-46 lead with 2:36 to go. Ludlowe's attempts to rally were met with more tight defense by the Mustangs and good ball movement by them. Another layup by Lee cut it to 50-48 as the final minute began. 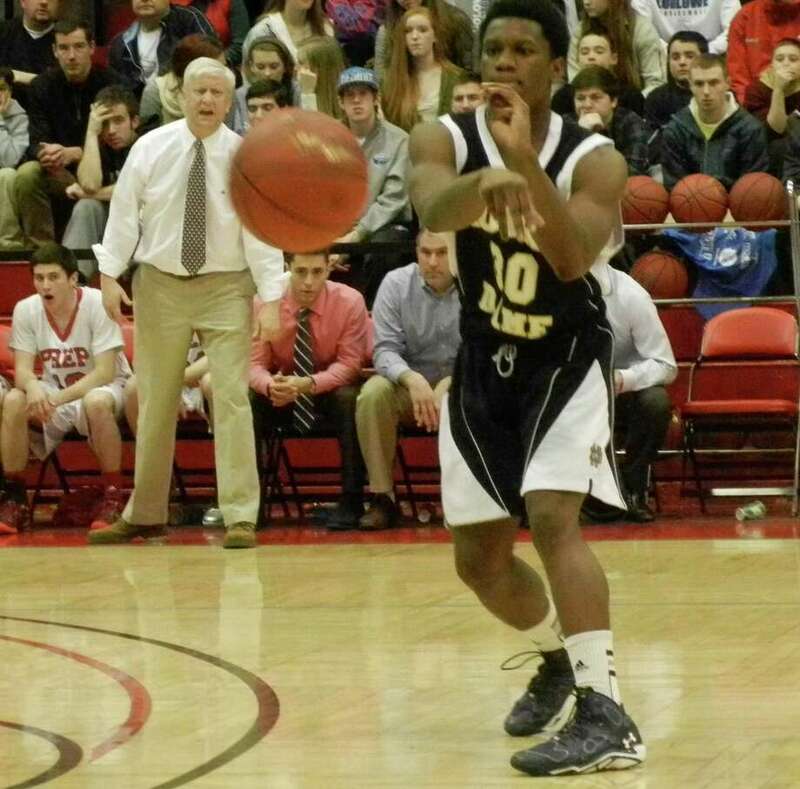 "We put pressure on them," Warde coach Ryan Swaller said. "We figured if we put pressure on them, we'd have a good shot at it. We did a good job with our help-side defense. "We're excited about the win. I felt we had been working hard. Turnovers had been a problem for us. Tonight we had 13." Warde was bolstered by the return of senior co-captain and guard Mike Pehota, who has been bothered by a chronic injury to his shoulder. He played close to half of the game. "We expended a lot of energy in the third quarter getting back into the game," Ludlowe coach John Dailey said. "They were really ready for us. They had a good game plan. I think they wanted it more than us tonight. We didn't get a lot of stops tonight in the fourth quarter. We missed some layups. They took us out of our game. "We showed a lot of fight tonight," Dailey said. "We've got to utilize our size a little more. It's going to take some time. We'll get better." Jordan Pettway 2 0-0 4 CJ Davidson 2 3-6 7 Jesse McIntosh 1 3-4 5 Jaylen Jennings 5 11-12 21 Jake Heaton 2 1-2 5 Joe Cantey 1 4-4 6 Anthony Gadsden 2 0-0 4 Raphael Torres 0 0-0 0 Justin Federici 0 0-0 0. Totals: 15 22-28 52. Paschal Chukwu 5 1-2 11 Dave Zielinski 7 0-0 18 Keith Pettway 4 0-0 10 Rich Van deBerghe 1 1-2 3 Tommy Nolan 4 2-3 10 Ryan Foley 1 0-0 3 Ray Featherston 3 3-3 11 Ryan Murphy 5 0-0 11 Patrick Harding 1 0-0 2 Bobby Haskins 0 2-2 2 Matthew Gerics 0 2-2 2 Drew Rolapp 0 0-0 0 Joe DiGennaro 0 0-0 0 Tate Duran 0 0-0 0. Totals: 31 11-13 83. 3-pointers: FP--Zielinski 4, Pettway 2, Featherston 2, Foley, Murphy. Matt Doyle 2 0-0 4 Darren Lee 6 0-0 15 Mark Malone 5 2-2 12 Chad Peterson 3 2-2 8 Kevin Hickey 3 0-2 4 Hayes Kelchner 2 0-2 4 Chris Howell 0 1-2 1 Jonah Rosner 0 0-0 0 Jack Armstrong 0 0-0 0 Kiran Prakash 0 0-0 0 Steven Zembruski 0 0-0 0. Totals: 21 5-10 50. Michael Pehota 1 0-0 3 Nick Cotto 7 5-5 10 Brian Kerrigan 1 0-0 2 Giacomo Brancato 4 8-9 16 Brandon Bisack 4 0-1 11 Chris Smaldone 2 2-2 8 Terrance Walden 0-0 0 Tommy Luckner 0 0-0 0 Kavon Polk 0 0-0 0. Totals: 19 15-17 60. 3-pointers: FL--Lee 3; FW--Bisack 3, Smaldone 2, Pehota, Cotto. Fouled out: FL--Lee.